PRO assistant referees Ian and Frank Anderson have turned their attentions to this weekend’s Eastern Conference Championship second leg between New England Revolution and New York Red Bulls, when they will line up alongside center referee Baldomero Toledo and fourth official Silviu Petrescu. The twins, who have made 36 AR appearances between them in 2014, are often assigned together for games having been on an officiating journey together for more than 20 years. Ian is the most-used AR in MLS this season but he is focused solely on his next appointment, at Gillette Stadium, which comes a year after the duo were involved in the 2013 MLS Cup Playoffs. 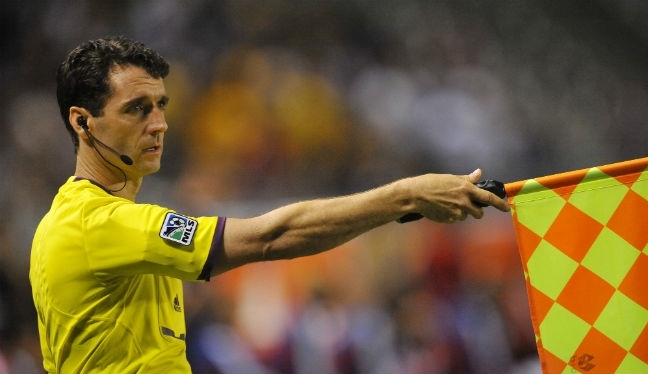 “It’s an honor to be involved this weekend, but also a big responsibility,” he told proreferees.com. “There’s a lot on the line for both teams and also for us as referees. The pair both enjoy each other’s company on and off the field, and are proud of the fact they have risen up the ranks and onto the PRO roster together. The Santa Barbara-natives made their professional debuts in 2005 and admit being together on assignments helps in the high-pressure environments of soccer. “Frank and I have been in this business twenty-something years and having my brother on this journey with me is a great thing,” Ian added. Saturday’s face-off in Massachusetts is another great honor for the Andersons, in a profession they fell in love with over two decades ago. Frank also believes the pressure will be somewhat relieved when he works alongside his brother at what is set to be an exciting match-up, with the Revs 2-1 ahead after their first-ever win at Red Bull Arena last time out. “Ian and I started refereeing together as 18-year-olds and we fell in love with it right away,” Frank said. “There’s tremendous pressure on these games, and when the whistle blows we are the opposite side of the field to each other. But everything before the game, whether it be in the locker room, at the hotel, or during travelling time, I have my best companion there. We get along great.